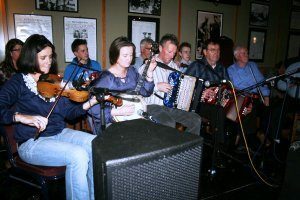 The 9th Annual Clifden Traditional Music Festival will take place this year from the April 1th – April 14th in Clifden, Connemara, Co. Galway. Music Sessions are a very big part of the festival and again this year feature a host of champion musicians from all over Ireland. Music sessions will take place all over the town on Friday night, Saturday Afternoon, Saturday night and Sunday afternoon. A big highlight of the festival this year will be the outdoor gig on Market Square on the Saturday night. Other highlights to watch out for will be Street Entertainment around the town with stilt walkers, face painters, jugglers etc a busking competition, and a 5K Run! As always at the Trad Fest, public events are free and we encourage everyone to come along and experience what should be a great weekend of music, song and dance.